Is your account manager stuck in an old school customer service mindset? Is your design team focusing on aesthetics instead of conversion? Is your web development process not centered around user experience? Or maybe your team is marketing and selling inbound—but not actually delivering. We’re witnessing a fundamental shift in how buyers purchase. These days, the way businesses grow, have meaningful conversations, and build customer relationships is changing. As inbound marketing believers, you know that—but has everyone at your organization really bought into the methodology? We feel your pain, but there’s a solution and we share it with you. 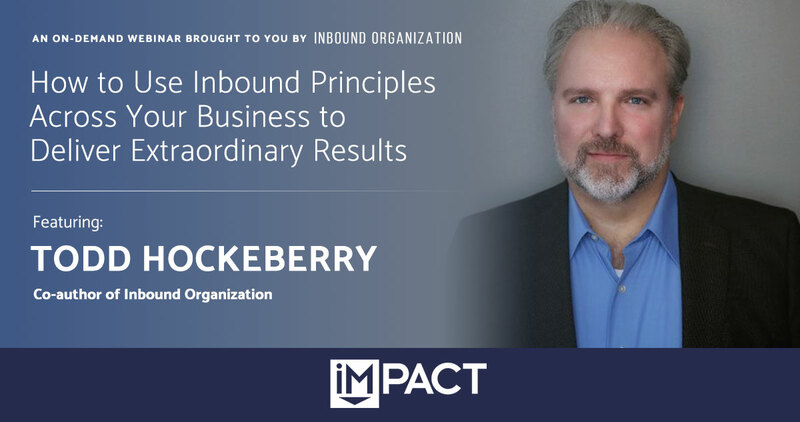 In this free, 60-minute webinar, Todd Hockenberry, founder of Top Line Results and co-author of the book, Inbound Organization, explains how to implement inbound principles across your entire organization to deliver extraordinary customer experiences and build your competitive advantage. Whether you're a marketing agency or a small B2C or B2B business, you learn how to truly embrace a holistic approach to inbound marketing at your organization and deliver unmatched customer experiences from sale to service. As the owner of Top Line Results, Todd has almost 30 years of experience in direct selling and leading organizations selling technology, capital equipment, and services in global industrial markets. Todd is also the co-author with Dan Tyre of "Inbound Organization: How to Build and Strengthen Your Company's Future Using Inbound Principles", scheduled for release in April 2018 by John Wiley & Sons.